The return on investment in global health is tremendous, and the biggest bang for the buck comes from vaccines. - Pakistan and Afghanistan - are in South Asia. In five out of eight countries in South Asia (Sri Lanka, Maldives, Bhutan, Nepal and Bangladesh), more than 90 per cent of children have been fully immunized. - The fully immunized child: 3.3 million additional children fully immunized by 2021 with a focus on the most marginalized. The UNICEF Strategic Plan 2018-21 has set a target that, by 2021, 85 per cent of children should be immunized with DTP-3. The Global Vaccine Action Plan set a target that, by 2020, 90 per cent of children in every country should be immunized against diphtheria, pertussis and tetanus (DTP-3). It also set a target that at least 80 per cent of children in every district should be immunized and is a proxy indicator to contribute to target 3b of SDG. However, current progress is too slow to meet these targets. UNICEF is a central partner of the Global Polio Eradication Initiative. This global endeavour has reduced the number of children paralysed by polio from 350,000 in 1988 to just 22 in 2017. These 22 children all live in Afghanistan or Pakistan, so these two South Asian countries hold the key to global polio eradication. In Pakistan, Afghanistan and every country with an active polio programme, the government takes the lead: UNICEF's role is to support. UNICEF's key technical support is in vaccine supply, in communications and in engaging with communities. 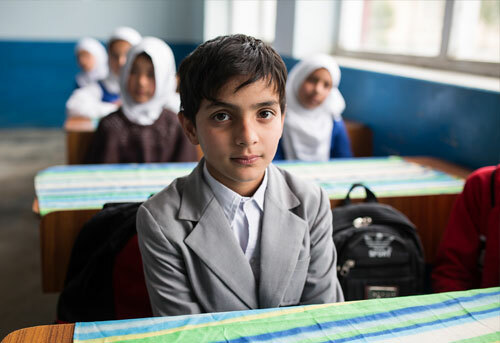 But UNICEF also looks to fill other needs as they arise - such as managing a complex network of over 25,000 full-time community-based vaccinators in the high-risk districts of Afghanistan and Pakistan. During 2017, around 20 million children did not receive first dose of DPT almost quarter of which lives in South Asia with slight decrease in the number of un immunized during 2017 compared to 2016. Conflict situation coupled with under-investments in national immunization programmes, vaccine stock-outs and disease outbreaks and weak health systems being the key reasons for under immunization. South Asia is home to 34.4 million children - almost a quarter of the world total. The number of fully immunized children in the region is 29.6 million4 leaving 4.7 million children unimmunized during 2017. UNICEF South Asia's target is to fully immunize an additional 3.3 million of these children, especially the most marginalized, by 2021. In 2014, there were 334 cases of polio in the region. By 2017, this number was reduced to 22 - a 90 per cent reduction. Great progress has been made over the last decade. Overall the number of unimmunized children in South Asia decreased from 6.67 million in 2007 to 3.4 million in 2017. From 2007-2017, in Pakistan, the number of un immunized children fell by 65 percent while in India, by 43 percent. Out of 19.9 million children globally who did not get third dose of DTP; more than half of them are in just five countries out of which two - India and Pakistan are in South Asia. There is an increase of 20 percentage points in country averages for DPT-3 coverage range from 65 per cent in Afghanistan to 90 per cent and above in Sri Lanka, Maldives, Bhutan, Nepal and Bangladesh. The average MCV-1 coverage for South Asia increased to 86per cent in 2017 with significant decrease in the number of children who missed their first dose of measles from 10.6 million in 2007 to 4.79 million in 2017. South Asia is strategically important as it is home to a quarter of the world's unvaccinated children. The countries of the region have varying capacities, reflecting their geographical size, the effects of conflict (particularly Afghanistan) and other factors. 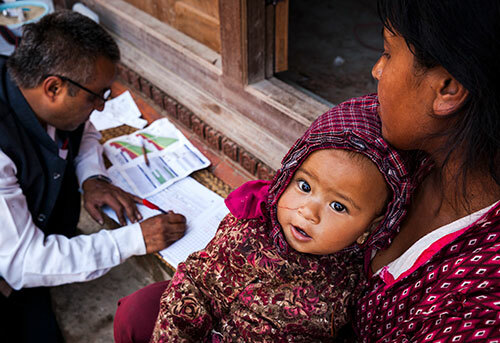 Gavi, the Vaccine Alliance, supports immunization programmes in Afghanistan, Pakistan, India, Nepal and Bangladesh. 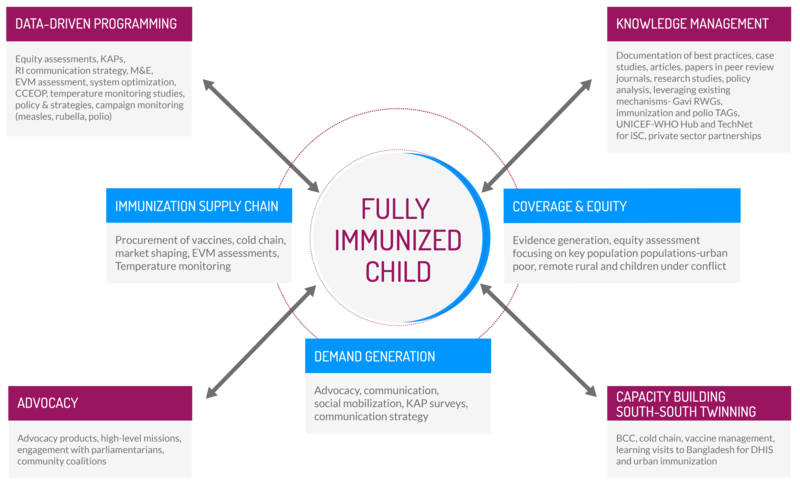 The immunization landscape in these countries is continuously evolving with a competitive donor environment. This underscores the ever-increasing need to mobilize domestic funds. For Bhutan and Sri Lanka (which have graduated from Gavi support), and for Bangladesh, India and Pakistan (which will soon transition from Gavi support), financial sustainability is a major challenge. This calls for increased advocacy with governments to create fiscal space for immunization programmes, and technical support for planning and financial management. A web of complex reasons underlies the slow progress. A vertical programme approach with inadequate cross-sectoral linkages is one issue. Weak governance, constrained fiscal space, weak programme capacity, poor data quality and lack of adequate monitoring and accountability frameworks are other key challenges. Other factors include fragile security situations, conflicts, rapid urbanization and population growth, especially of poor people living in urban slums and remote rural settings. 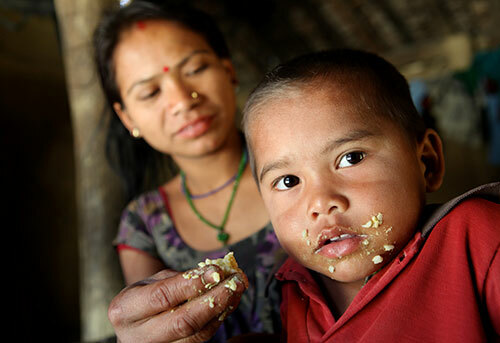 In India, communication-related issues are the main reasons why children are not immunized. The health workforce is poorly deployed and beset by absenteeism. Gaps in the capacity of health workers and mid-level managers affect their ability to make effective plans. 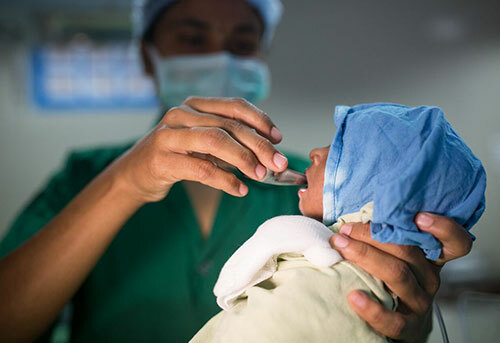 These challenges are further exacerbated by weaknesses in the supply chain, loss of trust in vaccines by some religious communities, and poor-quality routine data systems. There is an ever-increasing need for robust data and the implementation of evidence-based, context-specific innovative strategies. This requires strong programme ownership, supportive supervision and good monitoring and documentation. Pakistan and Afghanistan remains two of the three countries globally with wild polio transmission. This diverts critical political will and resources from routine immunization - in some areas less than 20 per cent of children are routinely immunized. Urban populations have grown significantly in recent years to more than 32 million; urban areas have the largest concentrations of under-immunized children in some states. Equity - are we reaching the right people? The region did not achieve the 2014-17 Headline Result but achieved substantial progress in both polio reduction and full immunization. In 2014, there were 334 cases of polio in the region. By 2017, this number was reduced to 22 - a 90 per cent reduction in just three years. The target of reaching zero was not achieved, but South Asia is now very close to success. UNICEF South Asia contributed to the transformation of polio programmes in both Afghanistan and Pakistan, improving both the quality of campaigns and cross-border coordination. This has led to historically low numbers of missed children and high levels of population immunity where it is needed most. The main focus in the region is on ending wild poliovirus transmission in Afghanistan and Pakistan. However, the global Eradication and Endgame Strategic Plan also requires South Asia to introduce a different type of polio vaccine, which has now largely been done. A process of transition planning is underway, so that the lessons and infrastructure of the polio programme will be maintained even after polio has been eradicated. 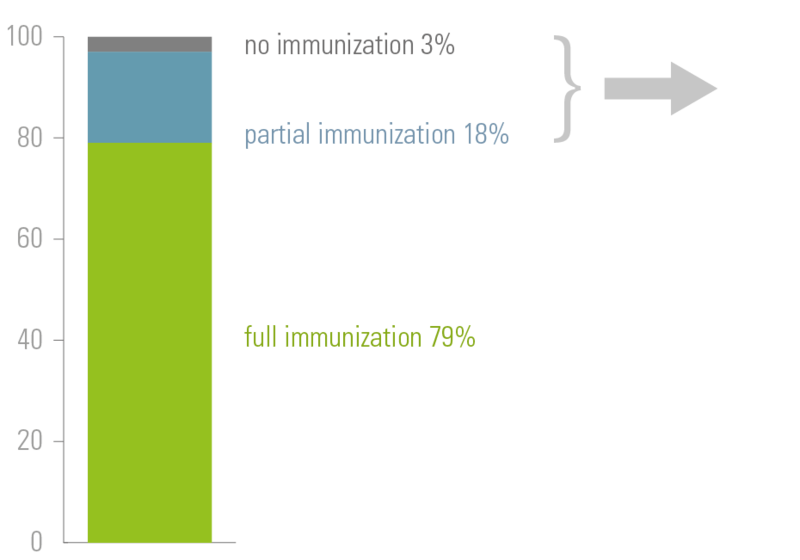 Although routine Immunization has not been part of the Headline Results until now, remarkable strides have been made in improving DPT-3 and MCV-1 coverage. Bhutan and Maldives were verified as having eliminated endemic measles transmission. And maternal and neonatal tetanus was eliminated in six out of eight countries of South Asia. The national figures for immunization coverage mask profound inequities within countries and within districts related to socioeconomic status, geography and mother's education (although no significant difference has been observed between male and female children). 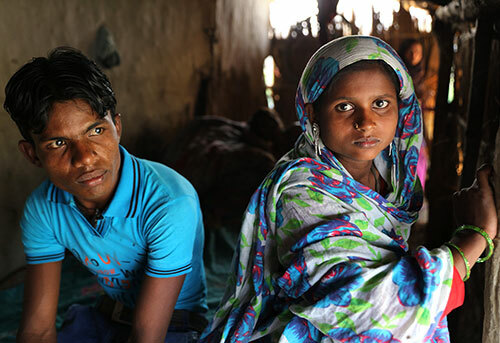 • Children living in conflict settings. UNICEF in South Asia will focus on reaching these three groups. The Global Polio Eradication Initiative (GPEI) is the largest internationally coordinated public health effort in history. In 1988, when the world launched this effort to eradicate polio, more than 350,000 children in 125 countries were being paralyzed every year by the disease. Today, millions of children are walking without support due to the efforts of the front line workers who went door-to-door to vaccinate children. 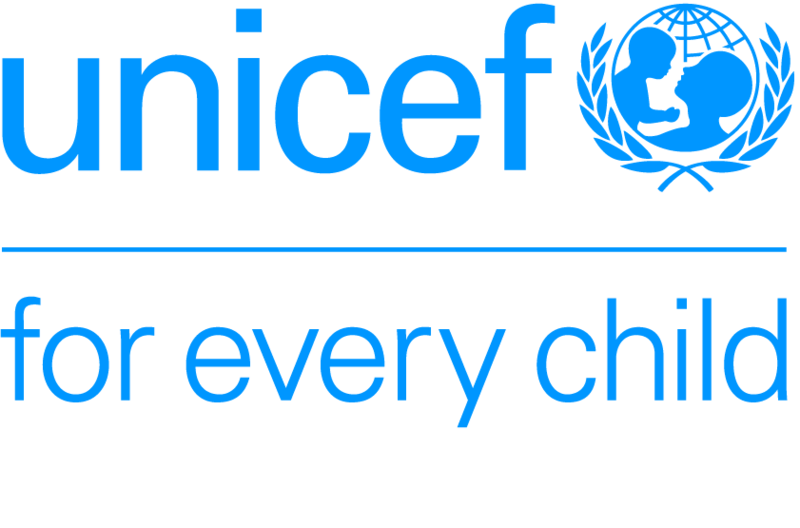 Within the GPEI, UNICEF is the lead agency for communication and community engagement efforts, vaccine procurement and cold-chain management. GPEI is led by national governments in partnership with the World Health Organization, Rotary International, the US Centers for Disease Control and Prevention and UNICEF. Underpinning the effort is a global network of more than 20 million volunteers worldwide who have collectively immunized nearly 3 billion children over the past 20 years. Bahl, S. et al., The switch from trivalent to bivalent oral poliovirus vaccine in the South-East Asia Region, Journal of Infectious Diseases, vol. 216, suppl. 1, 1 July 2017, pp. S94-S100. Fahmy, K. et al., Introduction of inactivated polio vaccine, withdrawal of type 2 oral polio vaccine, and routine immunization strengthening in the Eastern Mediterranean Region, Journal of Infectious Diseases, vol. 216, suppl. 1, 1 July 2017, pp. S86-S93. Hasman, A. and D. J. Noble, Childhood immunisation in South Asia - overcoming the hurdles to progress, Perspectives in Public Health, vol. 136, no. 5, 1 September 2016, pp. 273-277. Hasman, A. et al., Immunization Inequities in South Asia - a policy review, UNICEF Regional Office for South Asia, November 2016. Hasman, A., A. Rapp and D. Brown, Revitalizing the home-based record: Reflections from an innovative south-south exchange for optimizing the quality, availability and use of home-based records in immunization systems, Vaccine, vol. 34, no. 47, 11 November 2016, pp. 5697-5699. Hasman, A., G. Garg and D. J. Noble, Inactivated polio vaccine introduction in south Asia - 1 year on, The Lancet Global Health, vol. 4, no. 3, March 2016, pp. e150-e151. Hasman, A., H. C. Raaijmakers and D. J. Noble, Inactivated polio vaccine launch in Nepal: a public health milestone, The Lancet Global Health, vol. 2, no. 11, November 2014, pp. e627-e628. van den Ent, M. et al., Experiences and Lessons From Polio Eradication Applied to Immunization in 10 Focus Countries of the Polio Endgame Strategic Plan, Journal of Infectious Diseases, vol. 216, suppl. 1, 1 July 2017, pp. S250-S259. Report on the monitoring of Measles Rubella Phase I campaign Karnataka state of India, Feb 2017. Temperature Monitoring study report of Vaccine Cold Chain in Bhutan and Pakistan 2016. Effective Vaccine management assessments with report of Bangladesh (2014), Bhutan (2015), India (2013), Nepal (2014), Pakistan (2014) and Sri Lanka (2015). 30 year old Mamlikat is a resident of Shangla district, Khyber Pakhtunkhwa, and has been working as a Lady Health Worker (LHW), under National Programme for Family Planning and Primary Health Care since 2001. While not all LHWs are involved with the Polio Programme, Mamlikat is the only one in her area who agreed to take up the additional duties. Since then, she says she has never missed a single child in any polio campaign. The Pakistan polio programme has come a long way towards building a future, in which polio no longer endangers children, families, and communities. The number of Wild poliovirus cases and the genetic diversity continue to decline. Cases dropped to 8 in 2017 from the highs of 306 in 2014 and to date in 2018, 3 cases limited to one district and a radius of 5 km compared to 3 cases in 3 districts in 3 provinces at same time in 2017. One of the backbones of the polio eradication programme progress in the past years has been the use of local, trusted members of communities during vaccination campaigns, known as Community Based Vaccinators (CBVs). Mamlikat is one of the thousands of CBVs who work tirelessly and selflessly in all weather conditions and across all terrains to ensure that each child in every community is vaccinated and fully protected from polio. 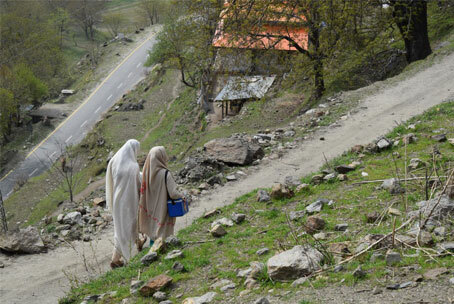 Shangla is a mountainous and difficult area to work in, as it requires a lot of climbing. Because of this, most female health workers refuse to work here. Mamlikat, however, has a zest and passion to ensure every child in her community is vaccinated. Her commitment to work can be assessed from the fact that in past eight years she has not taken any leave from work even once. Mamlikat, while on her duty, claims to have developed a bond with children of her community as she visits 40 to 50 houses on each day of a campaign to vaccinate approximately 100 to 130 children in these houses. Sharing her experience, Mamlikat said, "I can tell you the name of any child up to the age of 10, as over the years, I have been vaccinating them all myself." Further as she talks about her drive for polio eradication, Mamlikat adds, "They are like my own children and I cannot see anyone of them be paralyzed owing to polio virus." It takes approximately two hours to only reach the highest peak of the mountain, and even longer to reach the last house in the area. However, Mamlikat and other workers like her are reaching every last house, and every last child in every campaign. It is thanks to the efforts of frontline workers like Mamlikat that Pakistan has come so close to the target of zero.